“Lusty” reminder of policy problems | Curly's Corner Shop, the blog! HMS Illustrious in quick visit. 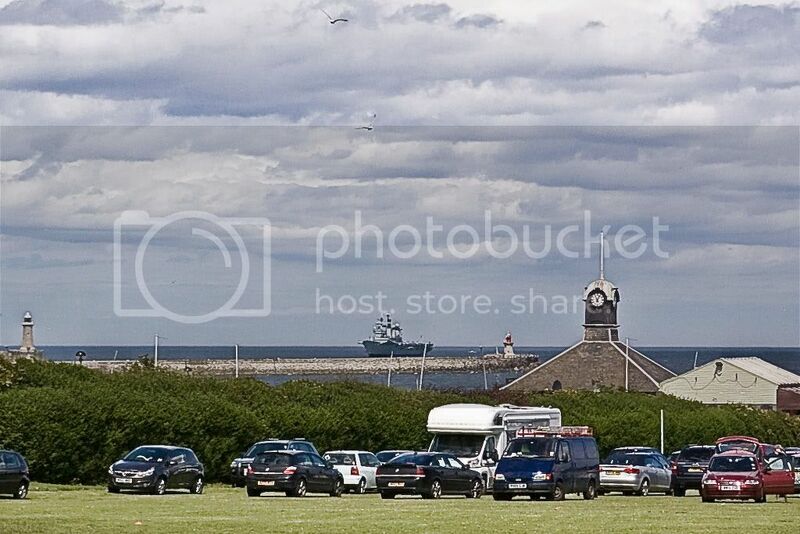 I was asked a few times yesterday about the “aircraft carrier” that was spotted anchored off the mouth of the Tyne as South Shields entertained thousands of visitors on a weekend dedicated to supporting Armed Forces Day. Following a small parade and presentation at South Shields Town Hall on Saturday morning there was a big presence of bikers and petrol heads at the Bents Park on Sunday as many people took advantage of rather hot and steamy weather to enjoy the seaside. The displays were quite impressive and it was pleasing to see an event organised by those who are probably more accustomed to bad press rather than being the subject of praise, however the Badlanders Motor Cycle Club and the Tyne Wear Chapter of the Hells Angels provided a variety of entertainment and bags of interest for those interested in monster machines, hot rods, heavy metal rock, vintage militaria, and generally good clean honest fun. They had live bands entertaining the crowds, lots of charity stalls, retailers, big bikes for sale, food and drink, and a car and bike show too, and the whole event was aimed at raising money for various charities with links to our servicemen and women such as Help for Heroes, Save Our Soldiers, and The Royal British Legion. HMS Illustrious seemed to have timed her visit purposefully, but it may well have been an opportune accident of timing as she undergoes sea trials around the UK coast following a £40m refit at Rosyth. “Lusty” Illustrious is classed as a “strike carrier” but in reality she is the last remaining through deck cruiser after the decommissioning of Ark Royal and Invincible, her decks are now fitted for carrying helicopters and she will serve as the UK’s on call carrier when HMS Ocean undergoes a refit. She has been in Rosyth dockyard for the past 16 months for an overhaul which has seen her communications kit enhanced, mess areas – the crew’s living spaces – revamped, a new anti-torpedo system fitted, and has had 540,000 litres of paint (enough to fill one fifth of an Olympic-sized swimming pool) applied, including a fuel-efficient coating to her outer hull which will make her scythe through the oceans more efficiently, among other work carried out by Babcock and the ship’s company. Above all, however, the ship emerges from refit capable of carrying up to 20 helicopters and 600 troops as an assault ship (a function she performed for real during operations in Afghanistan in 2001-02). said Capt Graeme Little, of the Capital Ships team at the Defence Equipment and Support organisation. After an initial week-long run-out of Rosyth earlier this month, a more thorough work-out for Lusty is now underway over the next five weeks. She’s due in Portsmouth in late July, when she’ll be formally handed back to the Fleet. I share the grave worries and concerns voiced by our top brass in the Ministry of Defence over our very stretched roles at present, and with two new carriers promised sometime never in the future we are left in quite a vulnerable position with one “strike (helicopter) carrier” on call at a time when the Argentinians are rattling their sabres over the Falklands again, if they had a mind to subjugate the Falkland Islanders I fear there would be little that we could do this time to relieve their plight. Worse still I cannot see our “friends” in America helping us, despite our clamour to help them out in Afghanistan! At a time of economic restraint British military adventures need to be very carefully considered and priorities ought to be given to the defence of the realm and defence of British strategic interests, before we even think about assisting in the so called Arab Spring! These “revolutions” in the middle east have not produced exciting results either for the protagonists or the outside observers who were perhaps hoping to see the emergence of liberal democracies, even in Egypt the military seems to have worked quietly but successfully behind the scenes to get the result that they wanted. Our involvement in Libya was premature and hasty and many of us had doubts over the altruism of the original motives, it is becoming increasingly expensive for the tax payer and stretches the Royal Navy and the RAF to their absolute limits, to add insult to the current impasse we have the Prime Minister telling his Defence Chiefs of Staff that their job is to do the fighting and it is his job to do the talking! Please don’t misunderstand me, along with thousands of other South Tynesiders, I fully and unambiguously support the dedication and professionalism of our armed services when the politicians have made a decision to deploy them abroad, and I also recognise that the MOD is a big beast capable of wasting many millions of our hard earned pounds just as well as any other department, but the Prime Minister must at least look as though he is listening to what his military staff are telling him. The message they are trumpeting is that we are involved in too many campaigns at a time when the politicians are asking them to slim down the operations and the budgets, you cannot get quarts out of pint pots! The answers to half of the current financial conundrums for our Defence Chiefs must surely be a very swift and total withdrawal from Afghanistan, regardless of the pace of the US draw down, and a lightning fast removal from Libya, in both cases we ought to make it quite clear that it is now up to the people of those countries to decide their own destinies and fates without external intervention. We have done our bit, it’s surely time for them to do theirs (if they really want that change). “Those in politics on the other side of the world can huff and puff but it will not change our resolve politically to retain the independence and the sovereignty of the Falkland Islands nor to come to their defence and to maintain deterrence as best we can. Those words need to be read very very carefully, he mentions political resolve but not military resolution, and he talks up deterrence “as best we can”, he talks of intent to keep the Falklands “liberated” from the Argentinians. All this with a few Typhoons and a navy that would fill the South Marine Park lake? Come on Dr. Fox, the only naval power that we might have left would be a nuclear submarine prepared to play very high stakes in an international game of poker! Either that or the big hearted Badlanders and Hells Angels from Tyne Wear and Durham might be enlisted to join a cargo carrier headed south to relive their glory days of 29 years ago! What would the investment of our heros lives have been i.e. those who lost life and limb, if there was the rapid withdrawl from Afghanistan? You seem to be saying that the government cannot be trusted with the foriegn policy or management of defence. Why then should we trust them with our finances? I see a summer of discontent, poor decisions made internationally, a wider north south divide and little hope for the future. As a right winger you seem to have at last seen some of the dire straights that the government has led us. I was listening to the minister for tourism stating at the SAGE in Gateshead, that the private sector should start thinking about inward investment because the RDA will be gone by the end of the year. What an idiot, it virtually went over 9 months ago. He struggled to answer the hard hitting questions that the private sector put to him. he was well out of touch and had nothing at all to offer them, nothing. Curly, its a mess and I can’t see it getting any better! There is no growth to take the strain, why because this governments policies have stagnated growth. If I’m wrong please tell it to the unemployed, those on benefits who must be jumping with joy at all of the good things that this government is doing for them and all of the jobs being created for them in the private sector. I know of very few unemployed people up here, do you know of any? Curly, start a multi party drive to get reinvestment going back in the north east and elsewhere, use your blog to engender good debate highlight issues that are affecting our people. Every bit will help! I’d much rather see debate than some of the public sector strikes that are looming and will do little good for anyone. Liam Fox can huff and puff about Argentinian Government and the forthcoming General Elections. The truth is that here there are more important topics is at the local news and the Government’s popularity has grown because of social development. Desperate words from a desperate position seem to be the ones in defense of the Colonial Power’s owners (not the english workers). Plus, it does not represent everyone’s opinion in the UK. A friend of mine, londoner, is really ashamed for these statements. “The Falkland Islands are kept free and their people enjoy the liberation we fought so hard for 30 years ago“, said this Defense Secretary. What liberation? Why does he talk about “them” in reference to the not more than 3,100 islanders if those are as british as a londoner? Someone is not being honest (apart from threatening). Sometimes in debates between Argentinians and British it seems that everything is about having the islands or not. My values and the values of everyone on this earth who support this position do not change according to the real opportunity or not to get the Islands. We all support a world of rights, of clear rules, of respect, of cooperation, of democracy, of PEACE; in their heavy and not banal meanings. The international community is supporting the Argentinian sovereignty more and more because they understand that today it is the Malvinas and tomorrow it could be another territory (in fact the UK has 10 of the 16 non-self-governing territories in the world). They don’t want discussion because discussing about the Falklands is discussing about many other things. Fox wants this to be a lesson of discipline for other countries, and impose silence by threatens. Barbarians have always been tough guys (they like spending money in war machines). Old habits die hard, but every empire is destined to fade away some day. I hope there will be a better UK ruled by more peaceful british people and a better relationship with us. I agree with your analysis Curly, this government seems to be quite strong on rhetoric but weak on delivering results, the general election gave us a change in management team rather than a change in direction.Cameron really does look like the heir to Blair.